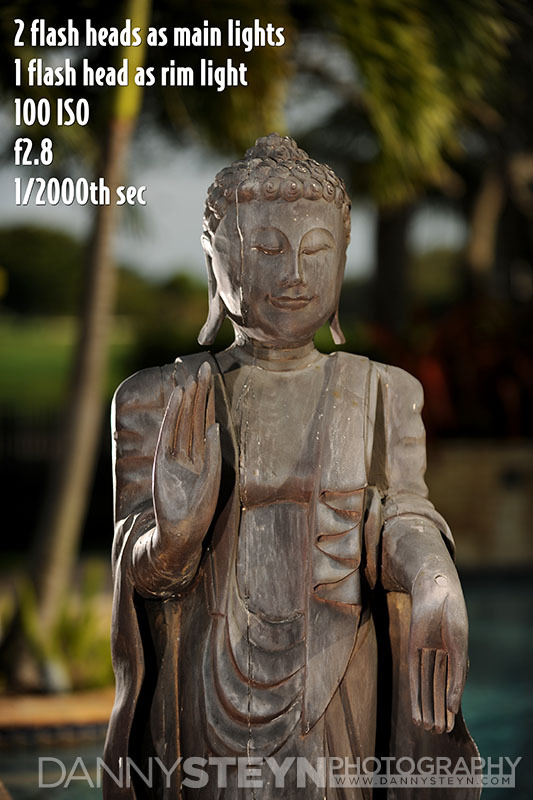 Pocket Wizard’s hypersync function allows you to use flash at shutter speeds well over the standard maximum synch speed of your camera (in most cameras the max flash synch speed is around 1/250th of a second). 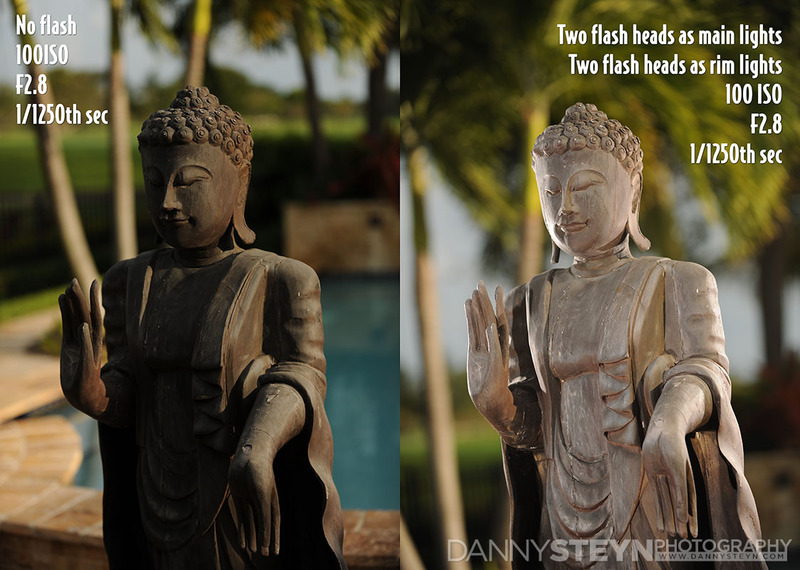 Why do you need flash synch at speeds over 1/250th second? If you shoot the model in direct sunlight and you want to use a wide aperture to create a narrow depth of field that blurs the background and makes the model pop out of the shot, then you have to use higher shutter speeds, even at low ISO values. My typical early morning sunrise beach shots require shutter speeds in the range of 1/1,000th – 1/2,000th at my preferred shooting apertures ranging between F2.8 and F4.0 at 100 ISO. This means that you cannot use flash and you need to use reflectors to fill in the shadows. Often the wind direction is coming from the same direction as the sun, and to keep the model rimmed by the sun, you end up with her hair blowing around her face, making shooting in the that direction almost impossible. 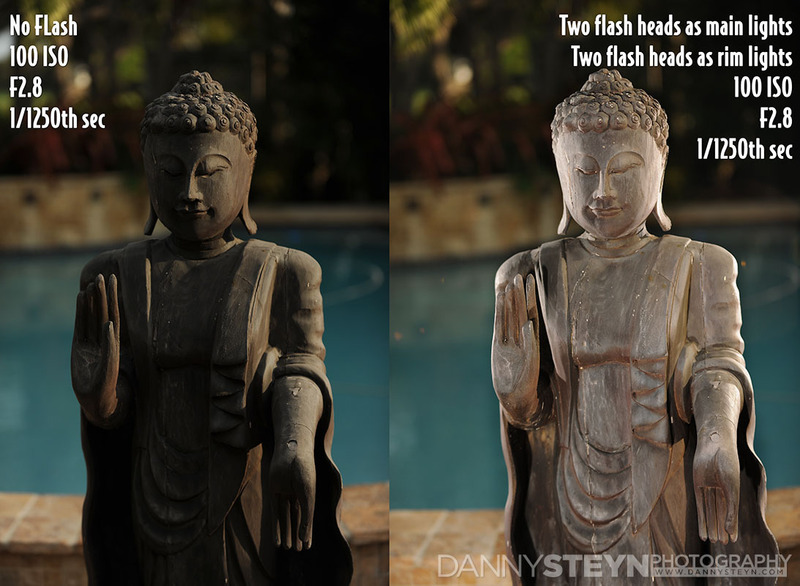 So it would be really great to shoot at 1/2,000th of a second at f2.8 and use flash to fill in the shadows. This gets around both of the problems above as the model no longer has to deal with a bright light continuously in her face, and it also allows you to orientate the model in such a way that the wind is blowing her hair in an acceptable direction. HSS (High Speed Synch). This essentially makes the Nikon strobes fire in continuous low power pulses, and while it works very well in most situations, the power fall off from the flash firing thousands of consecutive low power flashes means that you cannot get normal illumination from your flash. So you have to gang several flash heads together and bring the flash units very close to the model. This often results in uneven illumination and also results in overheating the flash heads if you are shooting a lot of images in quick succession. I have used HSS shooting models at high shutter speeds but the inability to pull the flash heads further back from the model to create more evenly lit model has resulted in less than ideal results, and the overheating is a real issue. 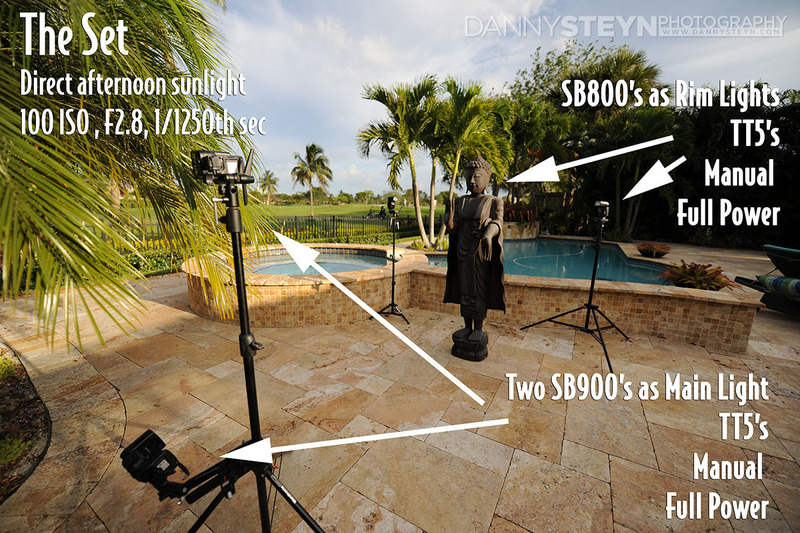 In this test I am purely going to see what results I can achieve with my Nikon D3x and my Nikon SB800 and SB 900 strobes in hypersync mode. I have 6 of these but will only use 4 in this test. I wanted to do the test with the default PW settings (not adjusting any timing offsets in the software application) to see if it would work and then only make adjustments if the results were unacceptable. I wanted to do the test at midday to deal with the harshest conditions but rain kept me inside and the test was conducted late in the afternoon. I shot at 100 ISO and F.8 with a 70-200mm lens. While I actually liked the look of the background exposure at 1/800th, I settled on 1/1250th of a second to see if I could get the flash to synch at shutter speeds that I would typically deal with in my normal early morning beach shoot scenarios. I positioned the flash units as follows. Note that I ganged two SB 900’s as my main lights as the distance to the “model” was too close to get even illumination over the full length of the model with just one bare flash head, so I added a second head lower down on the light stand to illuminate her “legs”. I am happy to say that I was able to get very usable results with the 4 Nikon flash heads at speeds all the way up to 1/8000th of a second at F2.8 and at F4.0. The minute I tried stopping down the aperture to F5.6 or smaller, the flash units were not able to illuminate the model adequately, so this is where the studio lights would start to come into play. I achieved these results with the default PW settings, no adjustments were made to the flash offset timing. It is important to note that when using hypersync, in these elevated shutter speeds, the flash duration is now inherently longer than the shutter speed, so now not only does the aperture control the flash exposure, but so too does the shutter speed. This is completely different to shooting with flash at shutter speeds under the sync speed where shutter speed has not effect on the flash exposure. This means that if you want to shoot at really high shutter speeds around 1/4000th or faster, you will have to gang several speedlights together to compensate for the reduction in illumination. to underexpose the ambient light background to create deeply saturated images. And I encourage you to do your own testing. Do not rely on my information as all cameras and flash units behave differently in Hypersync.